(PhysOrg.com) -- It's time once again for nature to put on its late-summer fireworks show: the Perseid meteor shower. This year's best viewing will be before dawn on Aug. 12, with a second chance after sunset that night, according to the editors of StarDate magazine. At its peak, this year's Perseid shower could produce up to 100 meteors per hour. The actual peak is during the day for viewers in North America, so they won't see as many meteors as other parts of the world. Note that moonlight will wash out the view of some of the meteors. On Aug. 12, the waning gibbous Moon will rise before midnight and climb higher hour by hour. It will be fairly bright, with more than 60 percent of its surface illuminated. Even so, one should still expect to see a fair number of bright meteors. 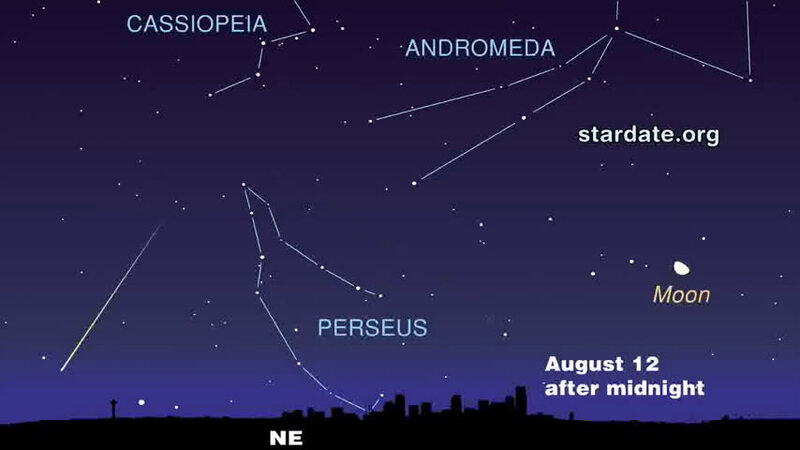 Perseid meteors appear to fall from the constellation Perseus, but they are not associated with it. The meteors are actually leftover debris from comet Swift-Tuttle. 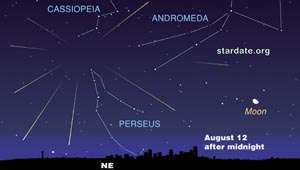 The Perseid meteors recur each year when Earth passes through its debris trail. For the best view, get away from city lights. Look for state or city parks or other safe, dark sites. Lie on a blanket or reclining chair to get a full-sky view. If you can see all of the stars in the Little Dipper, you have good dark-adapted vision. For best results, dark, city-free sky and wait till moon is relatively low in the sky for maximum meteor visibility. the weather forecast is rather cloudy for the netherlands, but Ill still try to see some. I'd wait a long time waiting for Tuesday Aug 12th.